The Red Kites regional team, representing west Wales, recently held a team building training day for squad members in preparation for the inaugural Wales Touch Nationals on the 6th & 7th April. Despite only coming together for their first session at the end of January, the team has made a lot of progress. It is fair to say that this is an inexperienced squad – a large number of the team are either completely new to Touch or have only been playing for a relatively short time. There is also a large contingent of young players with seven players still in school. The fact that the region has had to recruit inexperienced players is one of the reasons that the Nationals are so important to the development of the game in Wales. (See the ‘Historic Announcement for Touch’ post for more on this). But what the team makes up for in lack of experience, they certainly make up for in enthusiasm and commitment. 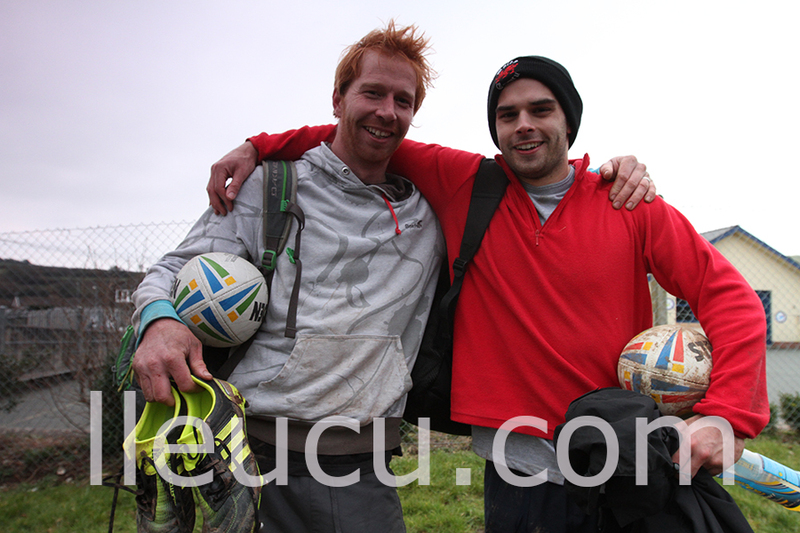 All of the training sessions held at Parc y Scarlets’ training barn were well attended and the recent team-building day at Pendine Outdoors, saw a strong bond begin to form between the players which will stand them in good stead when the going gets tough during the Nationals, which are being held at Swansea University Sports Centre. The instructors at Pendine did a great job of getting the group to work together on challenges such as the Spiders Web (pictured below) where each member of the team had to pass through the web without touching either the ropes or the trees – not as easy as it sounds! There were plenty of other tasks too – one of the other favourites was completing an assault course whilst transporting cups full of water, balancing a ball on a plate and carrying a bell which wasn’t allowed to ring! The team then took to the field at local club Laugharne RFC to recap on some of the techniques that they have been working on over the last couple of months and were able to run a Men’s Open v Mixed Open game, lead by Wales MXO international and Carmarthenshire girl, Jade Phillips. The Barcutiaid will go into the Nationals as rank outsiders and with players almost completely unknown to the other regions. The majority of the squad are not on the radar when it comes to national teams or Cardiff-based clubs such as Phoenix, Durkas or Raptors (Welsh clubs that compete in England’s top level National Touch Series). The sport is very much in it’s infancy in west Wales (the first Touch league only arrived in 2010 in Llanelli) and so far the Llanelli league has only produced two players that have competed on the international stage (Barcutiaid Assistant Coaches, Jade Phillips and Christen Rees-Jones – unfortunately both injured for the Nationals). However, this element of surprise may gave them an edge in games against the more experienced teams such as the Cyclones and Warriors who may be expecting a straight forward victory over the Kites. The west Wales players have the opportunity to put down a marker at the 2013 Nationals. This will be a chance to measure themselves against current international players and see if they have got what it takes to pull on the red vest in the future. Since it’s inception in 1991, Touch in Wales has been centred around Cardiff but this has been detrimental to the development of the game. Is it realistic to expect a country in which only 2,000 people play Touch in two or three leagues to produce the 112 top-class players required to field seven international Touch teams? Up until recently, around 5% of the people that play Touch in Wales, played for one of the international teams. There was no regional structure and the overwhelming majority of Wales players came through the Cardiff system. Compare that to the Wales national rugby teams where you have nearly 80,000 participants that eventually filter into the five national sides (Wales, Wales Women, Wales Sevens, Wales U20, Wales U18). In other words, less than 0.2% of rugby players in Wales will play on the international stage. In order to win Grand Slams and reach the final four of a World Cup, a large player base is required in which the most talented players are filtered from the club to the regional level and then on to international honours. International sport is about the cream of the crop representing their country. This years Wales Touch Nationals are the first step forward towards realising this goal. The Nationals will ensure that the game becomes more widespread across Wales and whilst initially there may well be a discrepancy between the emerging regions and the Cardiff heartland, it is unlikely that this will be the case for long. The Red Kites are a prime example of a group of players that may not have played Touch for a long period of time but are willing to put in the hard work and commitment needed to play at the regional and possibly international level. Who knows, perhaps the Nationals will uncover some hidden gems for next years Euros. Cyhoeddir carfanau Barcuitiaid Coch ar gyfer y Pencampwriaethau Cenedlaethol. 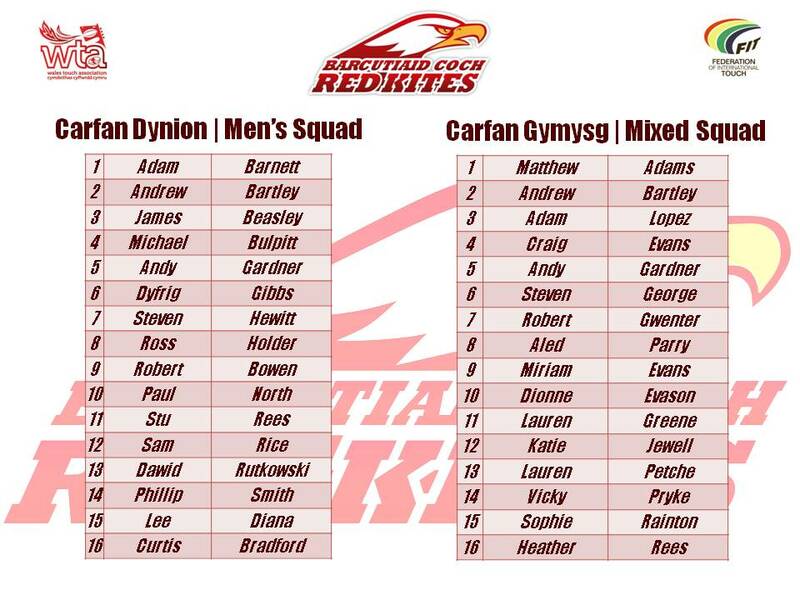 Barcutiaid Coch squads are announced for the National Championships in April. Barcutiaid Coch yw’r enw rhoddodd i’r tîm rhanbarth gorllewin Cymru newydd. Dyna’r fframwaith sydd newydd cael ei ffurfio gan Gymdeithas Cyffwrdd Cymru er mwyn darparu cyfle i bawb ar draws Gymru i gynrychioli eu rhanbarth yn erbyn y chwaraewyr gorau yng Nghymru. Ar y cyfan, carfan ifanc, ddibrofiad yw hi ond mae pawb yn frwdfrydig a barod i ddysgu sgiliau a thactegau newydd sy’n berthnasol i rygbi cyffwrdd. Rydw i’n wrth fy mod gydag ymdrechion pawb hyd yn hyn ac rwy’n edrych ‘mlaen yn fawr at y Bencampwriaeth. Fe fydd y Bencampwriaeth Genedlaethol yn cael eu cynnal ym mis Ebrill gyda’r chwe rhanbarth newydd yn brwydro yn erbyn i gilydd. Rhagor o fanylion ar wefan Cymdeithas Cyffwrdd Cymru. Barcutiaid Coch (Red Kites) is the name given to the new west Wales region. This is the new framework formed by the Wales Touch Association to provide an opportunity for everyone across Wales to represent their region against the best players in Wales. On the whole, it’s a young, inexperienced squad, but everyone is enthusiastic and willing to learn the new skills and tactics that apply to touch rugby. I’m really pleased with everyone’s efforts so far and I’m looking forward to the Nationals. The National Championships will be held in April with six new regions to battle it out. Further details available from Wales Touch Association.